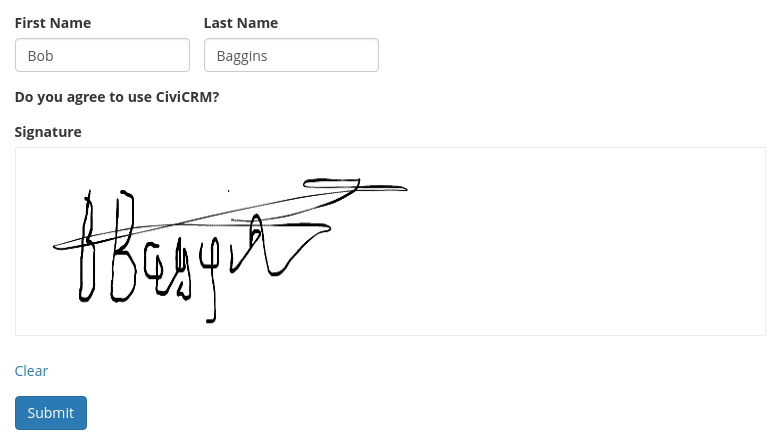 The signature is saved to a "file" type custom field on a contact or case activity. It uses the signature_pad library. Setup instructions can be found in the README for the module on github. That looks great! Thank you for sharing. Not sure what is provided. Is it "dry web" or "digital"? When you say that this is a "real" signature, I'm not sure what you mean. Is this a digital signature? Or is it just a way of storing a picture of something that someone drew on a touch screen (better called an "electronic signature" or a "dry web-signature")? It's just storing a picture, so "electronic signature" / "dry web-signature" would fit.